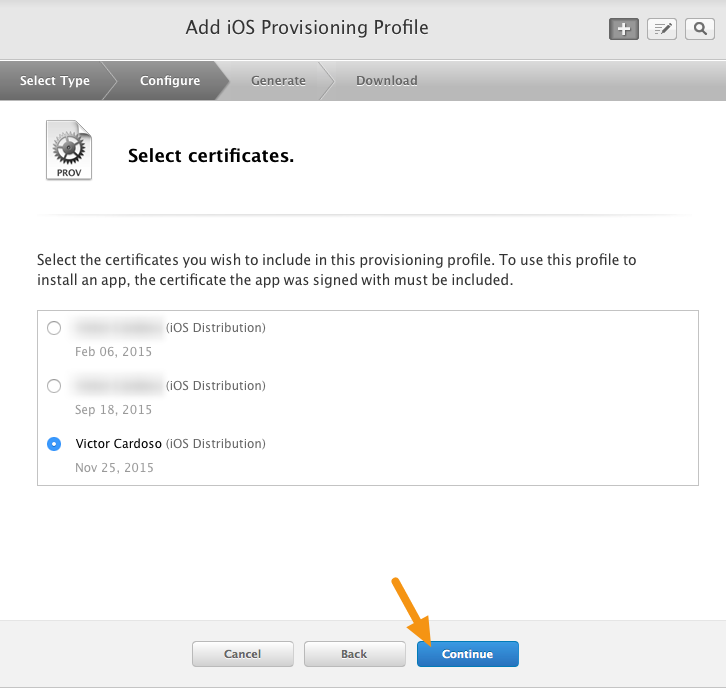 A Distribution Provisioning Profile is a combination of your App ID and Distribution Certificates. It authorizes your app to use particular services (like Push Notifications) and ensures that your app is submitted by you. This is why Distribution Certificates are tied to a specific Mac. 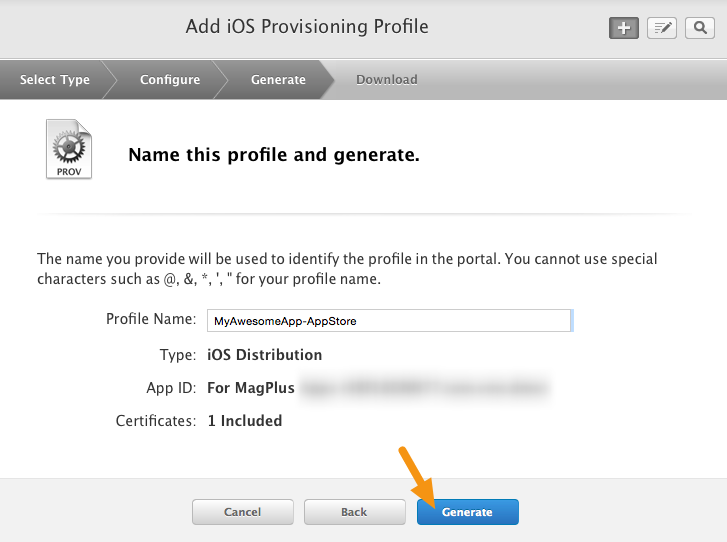 An App Store Distribution Provisioning Profile lets you post your apps in the Apple App Store. This article will help you create a distribution provisioning profile. Note: Customers creating enterprise apps for internal distribution only do not need to create an App Store Distribution Provisioning Profile. Instead, In-house Distribution Provisioning Profiles are used. (Optional) If you are planning to use Push Notifications, make sure you have created and installed your Push Notification Certificate (for more information, read the article "iOS - Creating a Push Notification Certificate.") Push Notification Certificates allow you to send messages to end users who have installed your app. They are also required for Newsstand apps. 1. 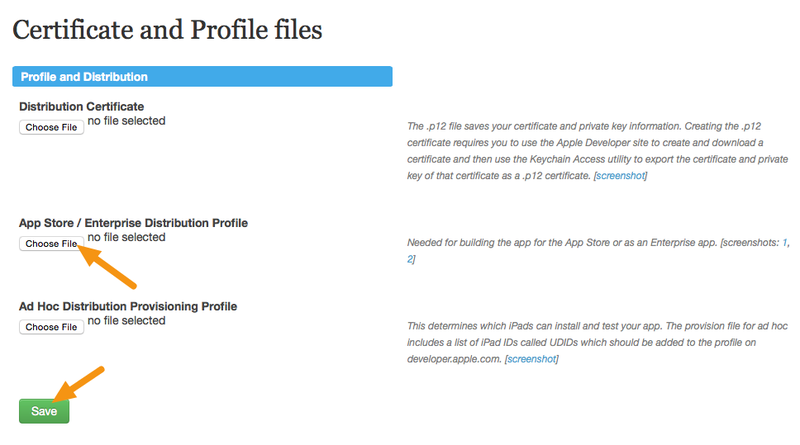 In the iOS Development account <https://developer.apple.com/account/#/overview/> and click on "Certificates, Identifiers & Profiles." 2. Click on "All" in "Provisioning Profiles." 3. Click on the "+" button to add a new profile. 4. Click on the radio button next to "App Store" and then click on "Continue." 5. From the pop-up menu, choose an App ID to associate with your app and then click "Continue.". Note: For more information on creating an App ID, read the article "iOS - Creating an App ID." 6. Click on the radio button next to your Distribution Certificate and click on "Continue." Note: For more information on Distribution Certificates, read the article "iOS - Creating a Distribution Certificate and .p12 File." 7. Enter your app name and "-AppStore" in the name field and click on "Generate." Note: mag+ recommends adding the text "-AppStore" at the end of your profile name. This helps identify it should you create more distribution profiles. 8. Click on the "Download" button to download your App Store Distribution profile. 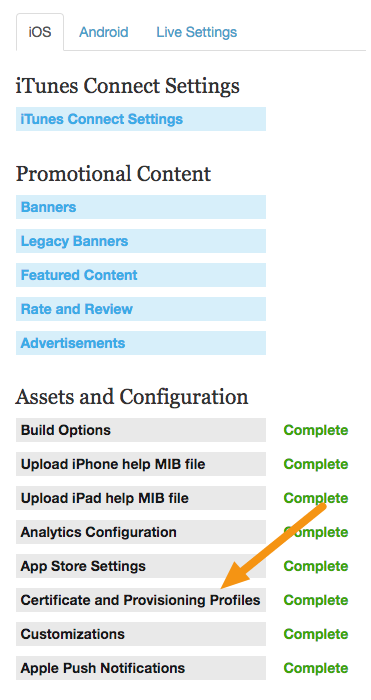 Note: Your App Store Distribution Provisioning Profile can now be uploaded to the mag+ Publish portal. 9. Login to the mag+ Publish portal <https://publish.magplus.com> and go to Apps > iOS > Certificate and Provisioning Files. 10. Click on "Choose File" under the App Store heading, select the profile you created earlier, and click on "Save." 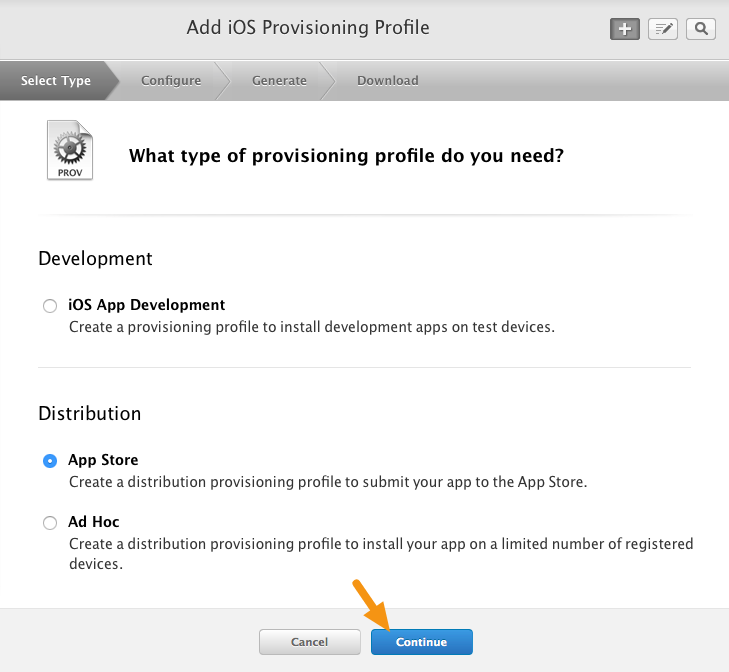 Creating provisioning profiles is only one step in creating an iOS app for distribution. 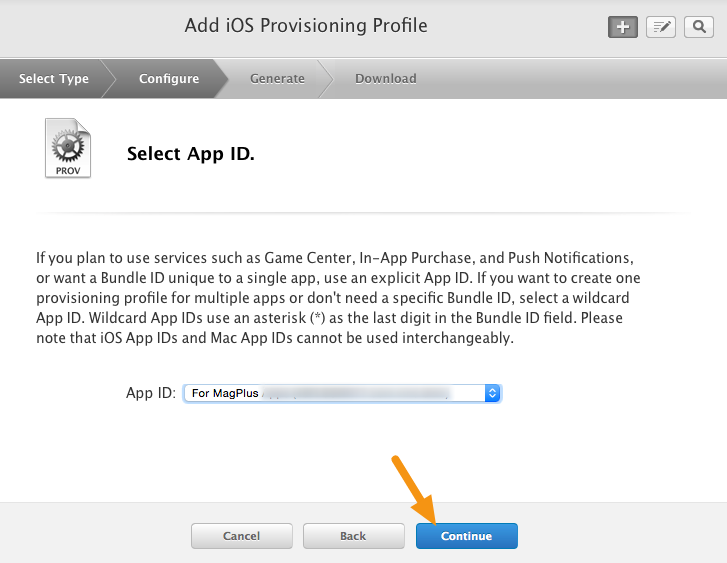 Please refer to the additional articles in this section for information on setting up and configuring in-app purchases, ad hoc distribution provisioning profiles, etc. These items correspond to settings in the Mag+ Publish portal. The portal will actually build your customized iOS app. You will then upload this app to the Apple App Store or to your own internal distribution servers (for enterprise customers only).